This summer I will be participating in the 40th Pan-Mass Challenge (PMC), where for the seventh consecutive summer I will be bike-riding 50 miles for Team Kermit to raise funds for cancer research because I want to be part of making a difference. I want to help rid the world of cancer. My cousin Jared fought a remarkable fight against brain and spinal cord cancer for two and a half years. In 2005, at just 21 years of age, he lost his heroic fight. 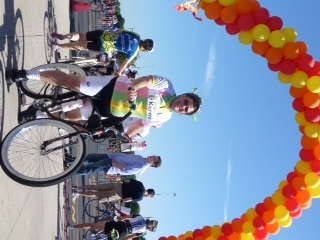 Since Jared's favorite character was Kermit the Frog, our team of over 60 family and friends ride as Team Kermit. In Jared's honor, the Jared Branfman Sunflowers for Life Fund for Pediatric Brain and Spinal Cancer Research was established to support the Jimmy Fund and Dana Farber Cancer Institute in Boston, MA. As a result of this research, our pedal partner Declan is alive and thriving at age 12 after receiving the same diagnosis as my Cousin Jared several years ago. Over the past six years, I have raised over $10,000. This year, I've committed to raising an additional $2,000, so please donate today. All donations, however big or small, are most appreciated! 100% of your donations will go directly to support the Jimmy Fund, which funds pediatric cancer research at the Dana Farber Cancer Institute.